The term ‘purpose-led business practice’ has been popping up a lot more recently. It’s a concept which is rapidly growing in popularity and is focused on ensuring that an organisation stands for something it believes in, going beyond profit and positively impacting society. If a company can direct its business model towards something that creates real purpose then they are able to call themselves purpose-led. If they can do that whilst demonstrating how their products create purpose and employees are delivering in a purpose-led way too then they’re truly championing the purpose-led business movement. What comes with being a part of this practice isn’t just status, there are figures to back up that purpose-led businesses have happier workers who become advocates of the company they’re working for. According to Digitalist Magazine, 90% of employees in purpose-driven organisations report feeling engaged, compared to 32% of employees in other companies. Purpose makes people 3 times more likely to stay in an organisation, leading to 1.4 times more employee engagement, and employee optimism levels are doubled. It also creates 75% more customer retention. This is all because purposeful organisations value their people. They are more innovative and tend to link results to employee’s efforts. Some of the most well-known brands are purpose-led and proud to be so. Unilever is one of the top-ranked purposeful brands. They state that to achieve this, they have ‘the highest standards of corporate behavior towards everyone [they] work with, the communities [they] touch, and the environment on which [they] have an impact’. What would there be less of in the world if your organisation didn’t exist? Ask yourself, what does your team get up in the morning to ensure that happens? What kind of work would your company turn down and why? A purpose is different to a vision or mission statement. It needs to be clear and concise. It needs to inspire your team and remind them of why they come to work each day. It also needs to be grounded enough so that it explains why your organisation specifically exists. Often companies believe they’re purpose-led simply because they say that they strive ‘to make a better world’. Without any explanation as to how they’re going to do that, they’re not truly purpose-led. How should their employees know what their work does to contribute to achieving the company’s purpose if it’s too vague and seems unachievable? This would suggest to them that they should take on any work that makes a better world. If, however, that same company decided to make their purpose to help people from deprived communities with education and better work opportunities then their goal would be clear and grounded enough to motivate their employees and make achieving it much more likely. If your business is wanting to make their purpose more clearly defined then one of the many benefits is that this can quickly clarify the position of everyone in the team. Those who feel that they are aligned with the purpose have a renewed sense of commitment and dedication to their work. Those who are not dedicated to the purpose have clarity on why the work had felt disjointed to them for so long so they can either re-adjust their expectations or choose to move on. If you’re starting a new company and want to make it purpose-led from the start then integrating your purpose into everything you set up will ensure that it’s present throughout your organisation, from your branding to your employees. Using your purpose to inform your actions from the start will ensure that it is a defining part of who your company is and what it stands for. The same exercise should be given to every role and team in your organisation. How are each of them uniquely contributing towards the overall purpose? This ensures that this purpose reaches every corner of work in your organisation. From the office management to sales or customer service, they all play their clear part towards fulfilling the purpose of the organisation. You then have every right to hold people accountable to purpose. A pivotal piece of having a purpose-driven business is thinking, reflecting, and speaking of purpose often. You will need to have metrics and goals based on your purpose put in place. These will measure your success as a team and should be derived from that team’s purpose. Whatever your purpose is, make your goals and metrics congruent with it. For Shake It Up Creative, we’re now in our 4th year of business and over the last year we have heard and learned a lot about how the ‘why’ you do what you do is so important. We have always shared the story of how we came together in business and talked about how we have ambition to grow the company extensively but also how we wish to remain a flexible creative services provider that operated with integrity. We recently learned about purpose-led organisations and how aspirational these types of businesses can be. We realised we were already two-thirds of the way to being one of those with the way we operate so we decided to formalise that. We have figured out our purpose and that is “to help organisations discover and then creatively communicate their purpose”. We’re working on the entirety of the messaging and execution; we’ve answered top tip number 1 and we’re working on numbers 2 and 3. This recent development for us fits so well and we are really excited to be taking it forward and truly becoming a purpose-led business. 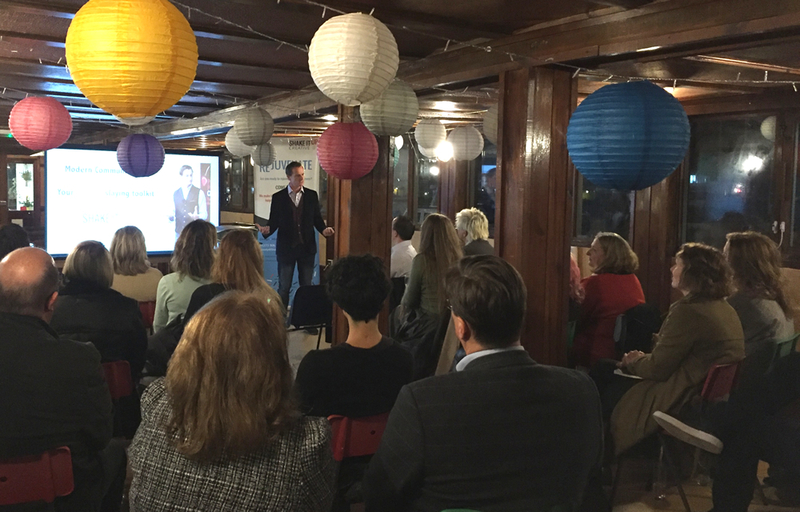 On Thursday November 1st, we hosted our first formal evening business event with professional speaker and communication guru Nick Looby. There are many synergies with our messages and our purposes and much of what Nick spoke about – slaying modern tech ‘zombies’ and trying to be heard above the noise – fits very well with us becoming a purpose-driven business. Let us know your thoughts about being purpose-led in the comments below.